Linden Endowment for the Arts: LEA20 -- Art Blue proudly presents IN THE GREEN, an installation by Norton Lykin. LEA20 -- Art Blue proudly presents IN THE GREEN, an installation by Norton Lykin. Art Blue proudly presents IN THE GREEN, an installation by Norton Lykin. It is placed inside the giant SURREAL CUBE which spans nearly over the full sim LEA20. 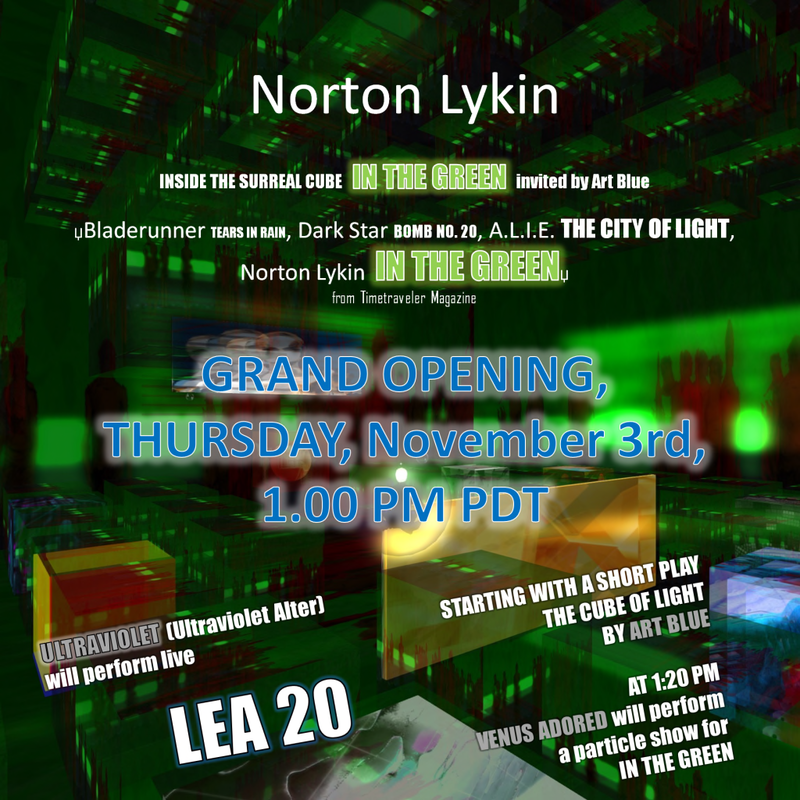 The Grand Opening on November 3rd, at 1.00 PM SLT will start with a short play THE CUBE OF LIGHT and a particle performance by Venus Adored. After this the audience is invited to travel, to drift, to go with the light in a bubble into IN THE GREEN. Norton Lykin is a highly gifted visual transformer for the mind, known from FREEDOM IN A SANDWICH, presented in July at the Surreal Tower Gallery which is curated by Juliette (JulietteSurrealdreaming). Venus Adored worked out a performance of Light which needs special viewer settings. 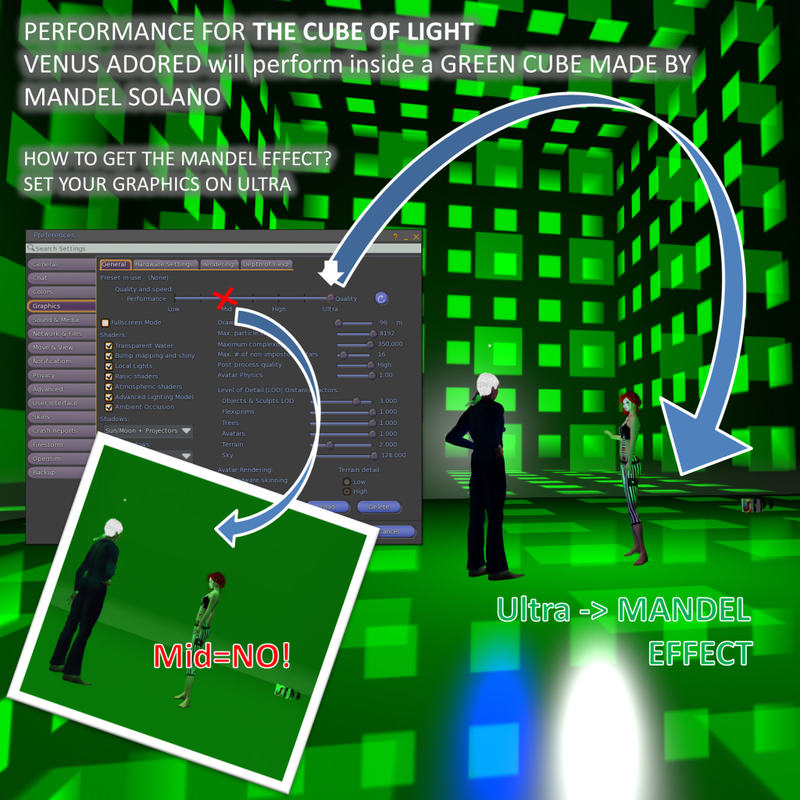 This is the first time the Mandel Effect will be used in Second Life. Please arrive right in time to get adjusted. See image below. Also Ultravioltet Alter will perform live at the Grand Opening. Please use the above settings. First try High and 32 meter - then expand.